I go absolutely crazy for sweet potatoes! With every Thanksgiving meal, I have to have my mom’s Mallowed Mashed Sweet Potatoes (recipe coming soon). I don’t discriminate either. Sweet potato fries, ice cream, baked sweet potatoes, you name it. Lately, I’ve been pinning a bunch of new recipes to try. I’ve seen some cakes floating around too, which lead me to discover that a sweet potato cake is very similar to carrot cake, so I thought I would give it a try! My grandmother’s carrot cake is by far one of my favorite things to make. I even shared a gluten-free version. I thought this recipe would be a good one to try out with sweet potatoes. Turns out, I was right! 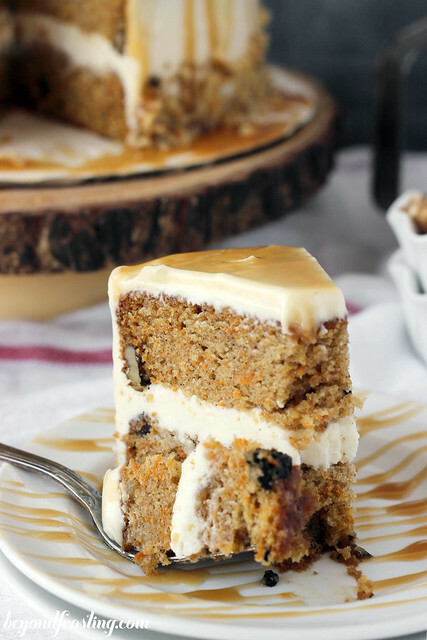 This Sweet Potato Cake with Bourbon Caramel Cream Cheese Frosting is one of those cakes that won’t allow you to put the fork down after the first bite. Let’s start with the cake. First, I finely shredded the sweet potatoes. I noticed they were quite a bit more wet than carrots, so when I was finished, I squeezed out the juice. Just take a handful of the shredded sweet potatoes and squeeze them in between your hands, then “re-fluff” it by just puling it back apart. I discarded the extra juice, which turned out to be a lot more juice than I thought there would be. I think this was an essential step in adapting this recipe. The only other alterations I made to my original recipe was adding an additional ¼ cup of flour to help with the moisture from the potatoes. I also added some nutmeg and a little bit of bourbon, just for fun. For some reason, when I think about sweet potatoes, I think about bourbon too. So then I decided to add a little bourbon to the cream cheese frosting. Best decision ever. Cream cheese frosting is always my favorite, but it has to be done right. I prefer more of a whipped cream cheese frosting, heavy on the cream cheese. 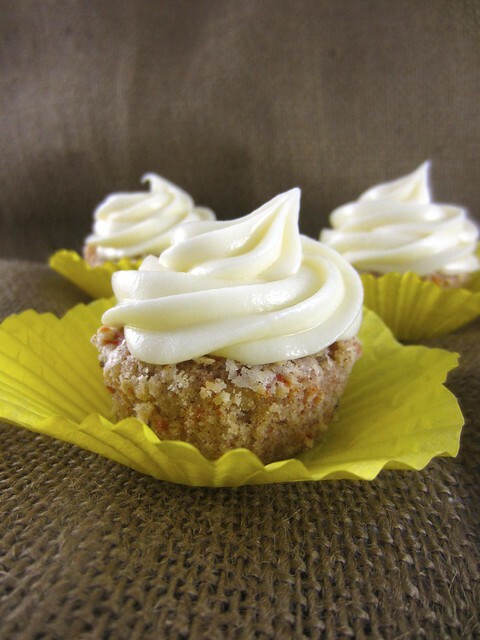 My go-to cream cheese frosting is slightly adapted from Martha Stewart. I add more cream cheese than her original recipe calls for, and I also add some heavy cream. This time, I opted to add some bourbon as well. 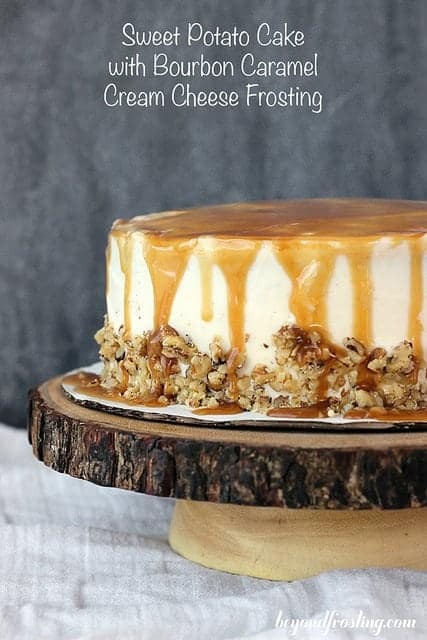 Once I frosted this cake, I thought it would be a good idea to drizzle some caramel sauce over the top. I didn’t use anything special, just some store bought caramel sauce (Hershey’s or Smuckers brand). 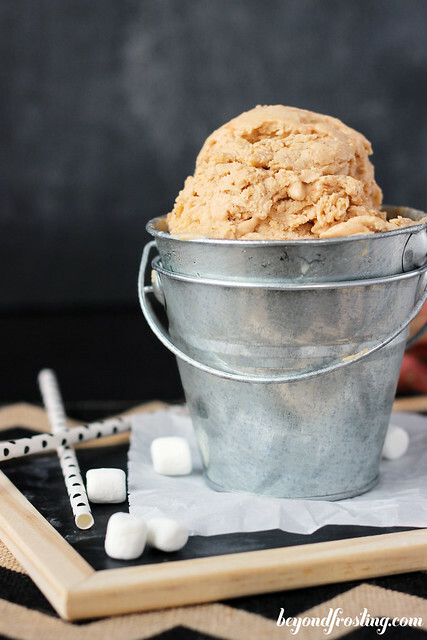 You can also try my friend Lindsay’s recipe! I used an offset spatula to gently spread it to the edges. 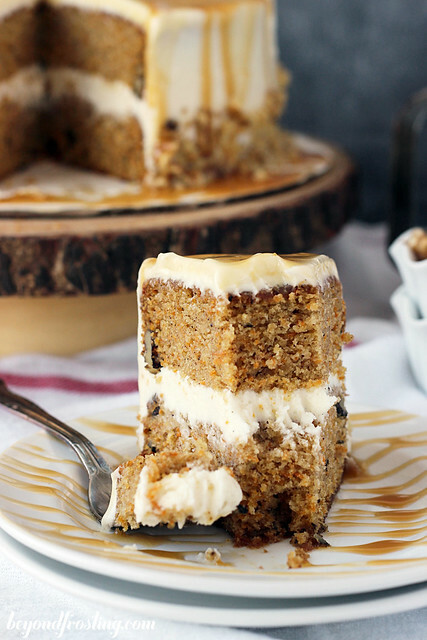 As the caramel drips down the cake, it will pool up on the cake plate. Ain’t nothing wrong with that! Then I decided to toss on some walnuts on the side of the cake too. 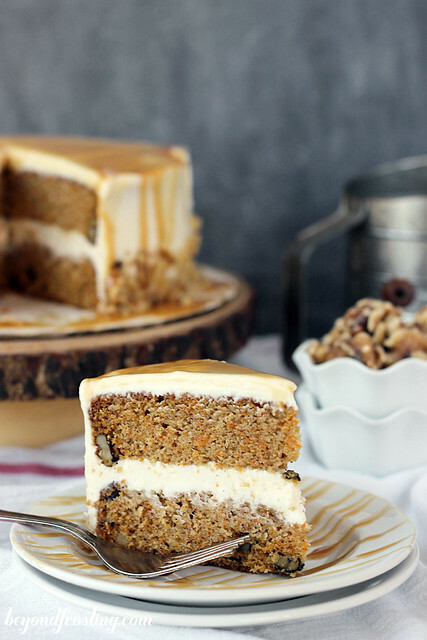 This cake does remind me a lot of a carrot cake, but with a bit more spice. I will most definitely be making this cake again over the next couple of months! I don’t make cakes very often, but I do love to do them. 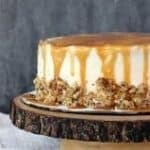 I have included links to a few of my favorite cake making items in case you are interested in improving you cake making skills. See below! 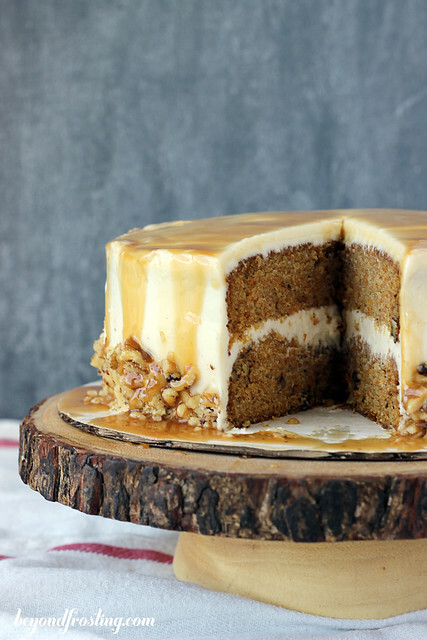 A spiced nutmeg sweet potato cake with a bourbon cream cheese frosting that is smothered with caramel. Peel sweet potatoes. Use a grater to shred the sweet potatoes into a bowl. When finished, use your hands to squeeze out excess juice from sweet potatoes. Pour out excess juice. Re-fluff sweet potatoes with your hands. Preheat oven to 350° and grease and flour two 8” pans. If you choose to use a different size pan, you will need to adjust the baking time accordingly. This can easily be made in a 9” pan as well as a Bundt pan. Lightly beat eggs with a fork. Add sugar and beat on low speed until smooth. Add oil and bourbon. Continue to beat on low speed until well mixed. In a medium bowl, combine flour, cinnamon, baking soda, salt and nutmeg; mix together. Slowly add flour mixture to wet ingredients and beat until incorporated. Fold in walnuts and sweet potatoes. Pour batter in greased baking pans. Bake for 40-45 minutes. Use a toothpick or knife to check the center of the cake. If your toothpick comes out clean, the cake is done. Allow cake to cool completely. Prepare the frosting by allowing the butter and cream cheese to come to room temperature for about 30 minutes. Combine butter and cream cheese in a mixer. Beat on a medium high speed until its light and fluffy. Slowly add powdered sugar one cup at a time, until each cup is incorporated. As the frosting thickens, add bourbon, one tablespoon at a time. Reserve the second table spoon if you prefer a stronger taste. Add heavy whipping cream and vanilla last. Incorporate into frosting and then increase speed to medium high and beat for additional 2-3minutes to whip air into the frosting. Refrigerate the frosting for at least 30-60 minutes while cake cools. To prepare the cake, use a cake leveler or knife to cut the dome off the cake, leaving a flat top on both cakes. Apply a crumb coat the cake (a thin layer of frosting) and put in the freezer for 20-30 minutes. Remove from freezer and add remaining frosting. Keep refrigerated. 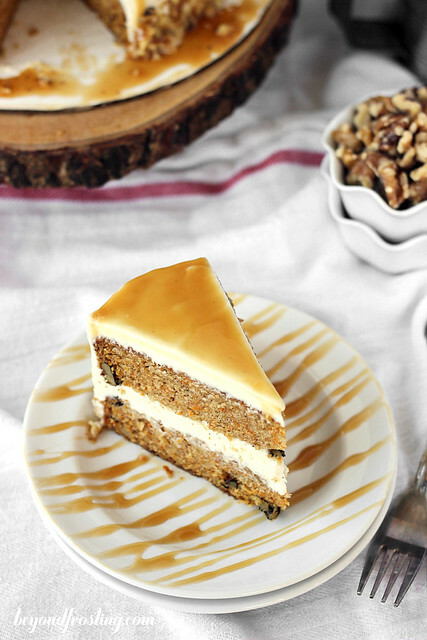 Before serving, use your hands to apply walnuts to the sides of the cake. Drizzle the caramel over the top of the cake and gently spread to the edges with an offset spatula. I suggest to prepare the cream cheese frosting while the cake is baking, since the frosting needs to set for a while. I just made this cake for our big family dinner last night. It was easy to make. I made the cake a few days ahead and froze the layers. They froze beautifully! This cake is delicious!! Everyone loved it! The only thing I changed was the nuts. I placed them on the top outer edge instead of around the bottom…only because of time! Thanks for this wonderfully, moist, delicious cake! Could i substitute the shredded sweet potatoes for cooked mashed ones ? Hi Lisa, that would drastically change the batter so you would have to adjust the recipe completely. I have not tested the recipe that way so I don’t feel comfortable telling you to try it, since there is quite a bit of ingredients involved. I don’t want you to be disappointed if it doesn’t work. 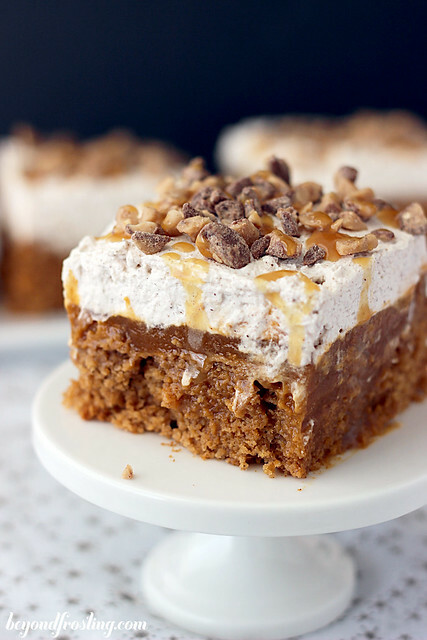 When I see a dessert like this, it makes me even happier that autumn is nearly here! I’m so crazy about sweet potatoes I named my cat Sweet Potato (three guesses what color he is). HA! That is so much fun Jean!